Bozeman, Montana – Sitting proud on Triple Tree’s highest ridge with commanding views in every direction this stately home is ready for you to move in today. Triple Tree is considered by many to be Bozeman’s finest planned neighborhood due to its ranch setting on rolling topography, open spaces, trail systems, access to public lands, proximity to Downtown Bozeman, and mixture of architectural styles. Sited on just over 2 acres, this home ranks with a handful of Triple Tree’s finest, and is certainly one of its most majestic. A blending of Old World charm and elegance, down-home Montana rustic materials, and unexpected details have resulted in a truly stunning four bedroom home worthy of the most discerning buyer. This masterpiece began as a non-descript Triple Tree home that noted Atlanta-based interior designer Linda K Allen was going to simply remodel for resale. Working with renown Bozeman architect Van Bryan, Ms. Allen quickly came to love the dramatic setting with its 360 degree views encompassing the entire Bridger Mountains, Gallatin Range, and Gallatin Valley floor. The scope of the project changed as Linda saw possibilities. Utilizing only the bare bones of the existing house, a total rebuild — with a master suite and wrap-around deck addition — was undertaken and the present 7,079 square-foot home was completed in 2007. This was the fourth, and last, home Linda undertook in the Bozeman Area. Her previous three homes sold for record prices, and two of them made the cover of Veranda. The Allens had intended to move into this house and call it home, but personal circumstances dictated that they move back to Atlanta. The home was vacant for a while, and rented for the past few years. It is now offered for sale well below build cost. 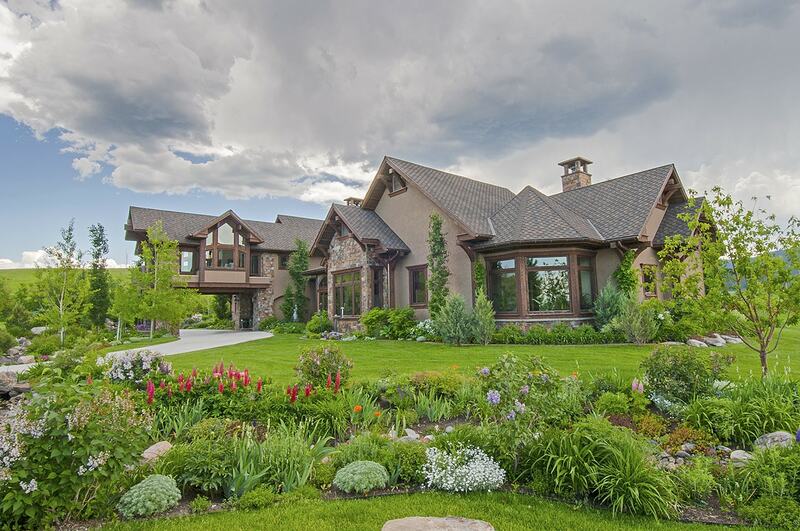 The home is designed for a sophisticated Montana lifestyle in harmony with the surrounding landscape. Organic and natural, the exterior is a combination of reclaimed vertical wood plank siding, plaster walls, framing timbers painted earthy taupe, stacked native-stone walls, pillars and accent walls, and a wood shingled roof with three distinct vaults. The architecture incorporates outside entertaining areas as an integral extension of the home. Rooflines, timber pillars, and walls extend to create a covered deck off the upper floor Master Suite that overlooks the front courtyard. The design is completed by a private, walled patio off the east guest room, with wrap-around covered decks on the west, south, and north sides of the home under a covered patio. Understanding and appreciating Montana’s weather, the position of the sun during the four seasons, and how people make the most of being outside, Ms. Allen brought the indoor/outdoor Montana experience to new levels with three distinctly different outdoor entertaining areas. She began to the east, at the front of the home, by integrating an expansive courtyard patio into the home’s entry area, just off the concrete driveway with its wide parking and turn areas. On the opposite side of the house, facing west, a wraparound covered deck was built, with a bump-out outdoor room that includes a wood-burning fireplace with sitting area, a generous space suitable for a dining table, wrought iron railings, and views that stretch forever. Below the deck, a covered patio was created on the lower level with seating areas and bordered by immaculate lawns. Both the deck and patio are ideal for watching sunsets and enjoying the play of the clouds in the broad Montana sky. All three outdoor areas have easy access to the home, with glass doors (most of them French) in the rooms adjacent to the deck and patio.